I'm using this Sunday evening explore the evolving trade market & examine the untapped potential of young players like Mat Latos, Brett Wallace, and even Andy Marte... who's fighting to avoid being the Gary Scott of this decade. In today's Seattle Times, Larry Stone provides his take on who are the "buyers", "sellers", "standing pat", and "could go either way". His buyers are the following thirteen teams: Angels, Astros, Brewers, Cardinals, Dodgers, Giants, Mets, Phillies, Red Sox, Tigers, Twins, White Sox, and Yankees. Stone's sellers include these nine teams: A's, Blue Jays, Diamondbacks, Indians, Nationals, Orioles, Padres, Pirates, and Royals. Standing pat, he has just the Cubs and Rays, and his could go either way group are six teams: Braves, Mariners, Marlins, Rangers, Reds, Rockies. I don't disagree with much, except that I think the Mets will be sellers. Larry seems to think that because the Mets won't raise the white flag because "the competitiveness of the New York market, couples with an expensive new stadium, almost dictates that they buy." If that is true, the Mets are even dumber than many Met fans already think they are. Sorry, Met fans, but this season is without hope. In our last post, we said they still had a prayer, but they've come out of the break flat... losing the first two games. Pitching Tim Redding tonight is the last straw. This past week, we heard he may be released. Well, what's taking so long? The only ways Tim Redding could be at a postseason game is if he (a) buys a ticket, or (b) gets a job as a sportscaster. He may have a future in TV or radio, with quotes like we saw in this David Lennon column: "I'm not an idiot," Redding said. The Milwaukee Brewers acted as aggressive buyers today. They traded minor leaguers Cole Gillespie and Roque Mercedes to Arizona for Felipe Lopez. This seems like a logical move, provided that they didn't give up too much. Lopez is a good second baseman and leadoff hitter. 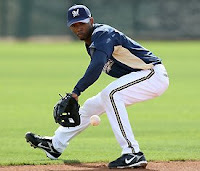 He will replace Craig Counsell, who was replacing Rickie Weeks. This is not good news for the Cubs, who will be battling the Brewers and Cardinals, at least, the rest of the way. Roy Halladay is the grandest prize of all. I've been meaning to write about him for a couple of weeks now. It was more fun to discuss the potential suitors a few weeks ago, when the trade rumor was new. For now, it looks like he will probably end the season with Toronto, and most people think the favorites to get him in a trade is Philadelphia. I have a different take. I think the likeliest trade partner is Milwaukee, who could include Alcides Escobar as the centerpiece of a deal. Bob Melvin, GM of the Brewers, has said that he won't trade Mat Gamel or Escobar, but I think he's posturing on the shortstop prospect. One overlooked facet of this opportunity is what I'm calling the Javy Vazquez rule. As Todd Zolecki, brought to my attention a few days ago, players who signed multi year deals before October 2006 may demand a trade in the offseason after being traded. Today, we saw the Major League debut of San Diego's Mat Latos. He lasted on 4 innings and 75 pitches, but 51 of those pitches were strikes, and he only gave up two runs. Latos struck out four and walked one. Because of innings limits to protect his arm, I think he has a chance to start around ten more games this season. He may only win a few of those games, but he should provide excellent peripherals and strikeouts for the Padres. I'm not a big fan of all those tattoos, though. He looks like a bit of a freak. By now, you've probably heard that Julio Lugo was Designated for Assignment by the Boston Red Sox. Lugo stinks, but since most middle infielders in the major leagues cannot hit, his .352 OBP will get him another opportunity. He's recently been linked to the Mets, which is another reason why their competitiveness this season is likely over. I have to include this quote because it is a bit jarring, when considering the source. Steve Buckley, of the Boston Herald, spoke with Lugo after the DFA news came out. Lugo said, "When you see a good looking girl, you get married and sometimes things don't work out." I think that was an odd way of describing his feelings, since on April 30, 2005, Julio Lugo put his wife, Mabel, in the hospital after allegedly hitting her in the face and slamming her head into a car hood. Derek Holland, Daniel Bard, and Aaron Poreda. These three guys have some of the more electric and unknown arms in the American League. I've already had an entire post on Daniel Bard, but I would like to say that I was terribly disappointed to see Jank the Tank picked him up in my roto league last night. I've had him on my team for a few stints this year, but since he doesn't start or close, he hasn't been essential. Now that he's on someone else's team, I can't wait to get him back. I guess I only want what I can't have. Derek Holland is starting for the Texas Rangers, and my team tonight. It's extremely rare that I start anyone who is pitching at Texas, but I thought it would be fun to roll the dice. He is a tall lefty who brings throws hard, with movement. How could he not improve on his home numbers? As I type this, the Rangers are leading 1-0 in the bottom of the first, as Ian Kinsler belted his 21st home run of the season to leadoff the game. Aaron Poreda is another left-handed stud who pitches in a hitter's park. He's on the White Sox, and I think he has a chance to be a front of the rotation presence. Ozzie currently has him in the bullpen, which makes me want him as a "poor man's" Daniel Bard. I'm still not over the fact that Daniel Bard got picked up. It's clear to me now that Dayton Moore is trying to get fired. The trade for YunieskyBetancourt made me think he wanted to get fired, but this is now unmistakable. I'm sure I made a face, when I saw Bard was claimed. Another face that I couldn't conceal was when I saw that Sidney Ponson is getting another chance to start for the Royals tomorrow. I'll conclude this long, pointless ramble with a discussion on two 3rd basemen fantasy players should keep in mind if they need help at the hot corner. One player is trying to save his career, while the other is hoping for a chance to get his started: Andy Marte and Brett Wallace. I likened Marte to Gary Scott in the introduction. Sorry for the lame Cubs' reference, but that's what I think of when a prospect third baseman is supposed to be good, and his performance is atrocious. Gary Scott was drafted in the 2nd round, by the Cubs, to be the first really good third baseman since Ron Santo. Marte was a super prospect in Atlanta's system. 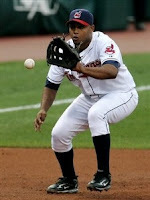 They traded him straight up for Edgar Renteria, and Boston flipped him in a multiplayer deal for Coco Crisp and others. This Cleveland Plain Dealer report, by Paul Hoynes, says the Indians' manager, Eric Wedge, is warming up to the idea of calling up Marte and giving him one more shot. He is out of options, so if he comes up and doesn't perform, they can't just ship him back to AAA; they'd probably lose him to waivers. His AAA numbers are good this season. Hoynes writes that he's hitting .321, with 21 doubles, 13 homers, and 54 RBI, in 73 games. 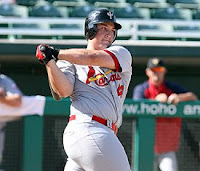 Brett Wallace is a big time prospect in the Cardinals system. They have not had the greatest of success with their third basemen this season, as Jimmy Hascup reports in this recent rotoprofessor column. With Colby Rasmus finally shining in St. Luis, Wallace is now considered their #1 prospect. He has shown the ability to hit pretty well with decent power, projecting to maybe 20+ HR's in the big leagues. His biggest red flag is his strikeout rate, which has been too high in the minors. In fact, his strikeout rate is probably the reason he's not playing for Tony LaRussa right now. If he can improve his contact rate, I wouldn't be surprised to see him get the job at 3rd base this season and have the Cards move Mark DeRosa to another spot on the field. If you made it this far, I applaud you, loyal reader. Please feel free to add thoughts in the comment section. As the radio host said in My Blue Heaven, "Fans, what are we gonna do about Wally Bunting?"